On December 17th, NES side-scrolling hero Mega Man will turn 22 years old. Capcom hopes to make a global celebration out of this admittedly random anniversary. 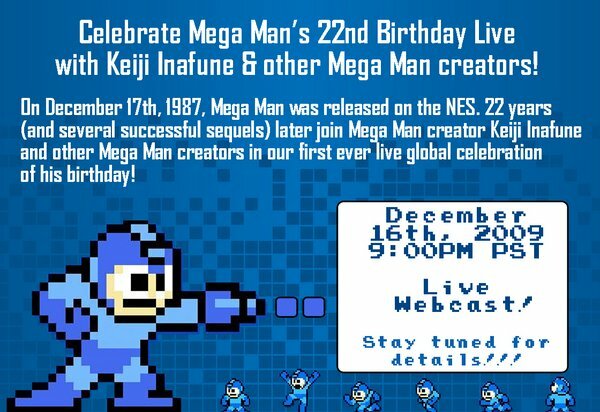 A new post on the Capcom Unity blog invites gamers to join Mega Man creator Keiji Inafune and other Mega Man creators in our first ever live global celebration of his birthday!" A live webcast is set to begin on December 16th at 9 PM. More details will be released closer to the event. While this may just be a simple celebration of the series and nothing more, you have to wonder whether they'll announce a new game in the series. They released a new retro-style MM called Mega Man 9 through PSN, XBLA, and WiiWare in 2008 to great acclaim. Are we due for another throwback?